Travelling around the Netherlands you are rarely far from water. Looking from train windows, cycling or walking the drainage systems are often evident and to my eyes they always seem to be brim full of water, even in the summer. We grew up on stories of the drainage and polders in our 1970s geography lessons. 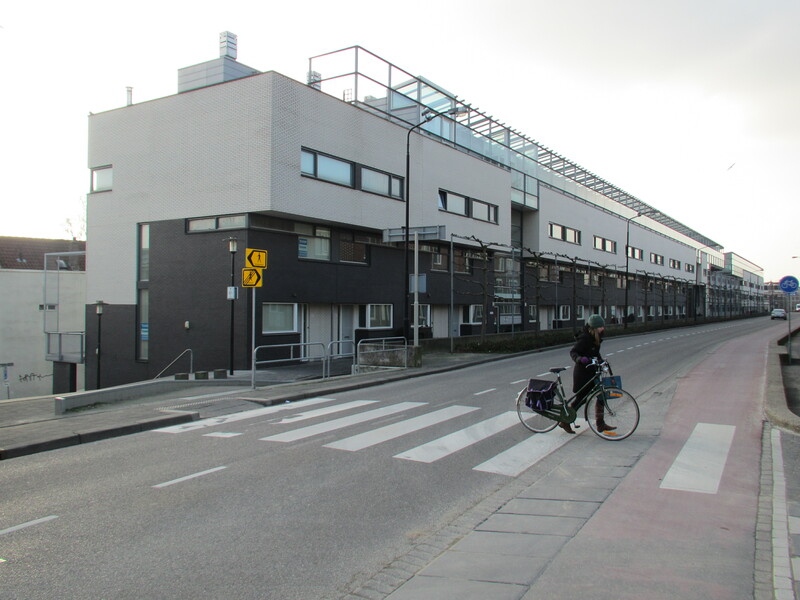 But when I was in Dordrecht last week I captured three images that really brought home to me how the development of land and housing are all wrapped up in this system. 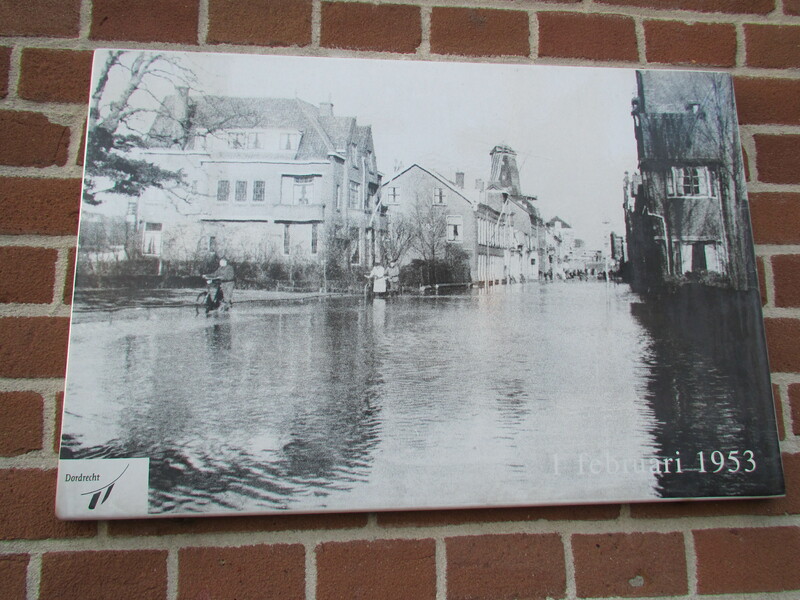 The same street forty years ago – the floods coming down the same street. Impressive juxtaposition. But look again at the original. There is a gap in the houses to the left where those yellow signs point. So turn left to look back to the street we have just come from on our bikes. I suddenly realise that the street we have just cycled along is way below the level of those 1953 floods and every house we have passed is in effect outside the protective barrier. The 1953 floods would have come almost to the roofs. How comfortable would I feel there? No idea, but my discomfort tells me I’m definitely not Dutch. This entry was posted in Countries, Musings, Travel and tagged cycling, Dordrecht, Floods, Netherlands, Water by kevinmayne. Bookmark the permalink. That’s why we do live next to the dikes. I think I’d be living behind the biggest dike I could find! PS. 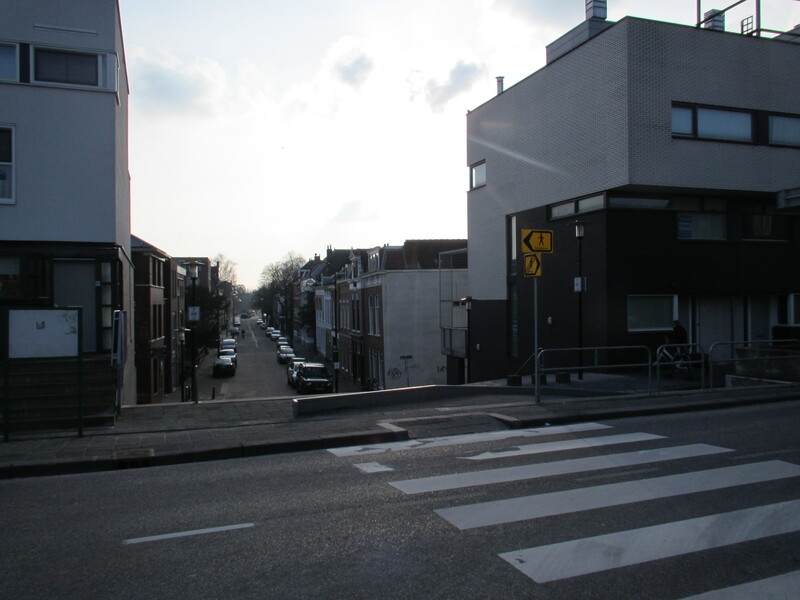 The girl crossing the road is Isolde, my daughter ;-). Wow, that is a small world! I was told that the houses on the dike were special and should survive and protect from flooding. Very impressive. But the ones down below….. Given the extraordinary level of flooding in the UK in recent years the confidence in the systems in place is eye opening. I would never ever buy or rent in a flood plain.